Hey, Wall Street: Show us the money! That's the message New York Attorney General Andrew Cuomo sent Monday, asking the top Wall Street banks to disclose details about their bonus and compensation plans for the 2009 fiscal year. 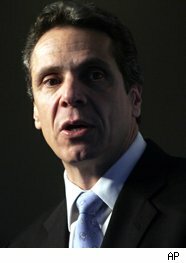 In a letter sent Monday, Cuomo made the request of eight Wall Street banks that received federal funds as part of the government's Troubled Asset Relief Program, or TARP.Although the TARP money has been repaid, that's not stopping New York's top cop Cuomo -- widely thought to be gunning for the governor's mansion in Albany this year -- from calling on the banks for disclosure. Wall Street pay packages should "be based on incentives that build strong institutions, not built on incentives that bring the nation to knees economically and are based on short-term, fictional profits," Cuomo said in comments cited by Dow Jones. Wall Street firms are expected to begin paying out employee bonuses in the coming weeks. Cuomo's request comes as Wall Street firms continue to face deep public anger over how they can continue lavishing billions in bonuses to already-wealthy bankers during the worst recession in generations. Many people are particularly incensed because firms would have gone bankrupt -- or so the public was told -- had it not been for a gargantuan, publicly funded bailout package worth hundreds of billions of dollars. Cuomo sent the request to the following financial firms: Goldman Sachs (GS), Citigroup (C), J.P. Morgan Chase (JPM), Morgan Stanley (MS), Bank of America (BAC), Bank of New York Mellon (BK), State Street (STT) and Wells Fargo Corp. (WFC). The attorney general has set a deadline of February 8 to receive the information. Cuomo has also asked the banks for information on their lending practices over the last year. The logic behind the Wall Street bailouts, of course, is that once they returned to health, the banks would begin to lend again, easing the credit crisis and pushing liquidity into the financial system. Yet according to numerous reports, the financial system remains locked in a severe credit crisis. For Cuomo, the move may be as much about bolstering his tough-on-corporate America credentials than about calling Wall Street firms to account. One of the worst kept secrets in New York State politics is Cuomo's ambition to be governor of the state, just as his father, the legendary Mario Cuomo, once was. "It's common political wisdom that Andrew Cuomo wants to be the governor of New York," Steven Greenberg, a pollster at Siena College in Albany, N.Y., toldDailyFinance last fall, as the attorney general set his sights on Intel, the giant chip-maker which has been bedeviled by charges that it has routinely abused its market power to hurt its smaller competitors. So it's no surprise that Cuomo is framing his bonus information request in populist, anti-corporate rhetoric, at a time when public antipathy toward Wall Street is higher than its been in decades. "The taxpayer paid a terrible price for this economic recession," Cuomo said, trying to channel public outrage. "The average New Yorker, average American is still paying the price for this terrible economic debacle." "Transparency and disclosure of the banks' practices and plans are essential especially at this time," Cuomo added. "Trying to hide and secret information never works." Given the conduct of the major Wall Street banks over the last several years, it's probably a good thing for the public to gain more information about their compensations practices, especially since it was the public who saved the banks from failure. But it's important to remember that with New York's gubernatorial election coming up this year -- and Cuomo eyeing a possible run -- nothing he does can be divorced from politics.